Video conferencing refers to conducting conference using telecommunication technologies for a real-time two-way transmission of audio and video. With rise in globalization, organizations are shifting toward videoconference meetings so as to enable faster decision making and reduce travel hassles. In the corporate sector, video conferencing is predominantly used for effective real-time communication over long distances at minimal cost and time and enhance productivity between teams based at different locations worldwide. Additionally, it saves travel expenses and addresses customer queries in real time. The global video conferencing market is anticipated to grow at a CAGR of 7.9% during the forecast period. It was valued at approximately US$ 5 Bn in 2016. The video conferencing market is witnessing significant growth owing to the rising adoption of cloud-based video conferencing solutions globally. Increasing adoption of cloud-based video conferencing services has led to implementation of better encryption and password protected solutions for cloud-based video conferencing systems across the world. Furthermore, rise in usage of cloud-based solutions and emergence of 3D technology in video conferencing solutions are a major factor accelerating the demand for this solution globally. According to a report published by the American Telemedicine Association in 2015, more than 200 academic medical centers in the U.S. offer video-based consulting to clients based in other parts of the world. Video conferencing is a common technology tool used by enterprises for enhanced collaboration. Additionally, organizations are increasingly focusing on curtailing costs related to their means of communication. This has created immense opportunities for the video conferencing market, thereby, leading to development of advanced conferencing solutions and services. Furthermore, considering the rising need to reduce operating costs, there has been a recent shift from the traditional immersive telepresence systems to software solutions in the video conferencing market. Enterprises across the world seek to deploy low-cost and scalable cloud-based video conferencing solutions to reduce the total cost of ownership (TCO). Managing business in the global context and increasing adoption of video conferencing solutions by small and medium enterprises (SMEs) are the key factors driving the growth of the video conferencing market globally. Cloud-based video conferencing services offer higher accessibility to end-users, as the infrastructure is managed and maintained at the service provider’s site. Moreover, the rising trend of mobile workforce and Bring Your Own Device (BYOD) has led to widespread adoption of cloud-based video conferencing services. At present, the on-premise segment accounts for a major market share, whereas, the cloud-based video conferencing segment is expected to exhibit higher CAGR during the forecast period. Verticals such as healthcare and government & defense are expected to register strong growth in the next few years. The global video conferencing market comprises large as well as mid-sized manufacturers and suppliers. Companies such as Cisco Systems, Inc., Polycom Inc., and Huawei Technologies Co., Ltd. have been able to establish their strong presence in various countries across the world. Vendors in the video conferencing market are currently focusing on introducing advanced software and integrating new capabilities in the software to enable video conferencing across company boundaries and meet the need to manage video delivery and quality. Moreover, video conferencing solution providers are aggressively developing innovative products to meet customer expectations for enhanced features and integrated capability over connected devices. The video conferencing market is presently in a growing stage and the leading players are focusing on acquisition of local players in order to broaden their geographical reach. Other significant players engaged in the video conferencing market include Adobe Systems Incorporated, Arkadin Cloud Communications, JOYCE CR, S.R.O., Logitech International S.A., Microsoft Corporation, Orange Business Services, Vidyo, Inc., West Unified Communications Services, and ZTE Corporation. This comprehensive report by Transparency Market Research analyzes and provides market expansion forecasts for video conferencing solutions and services at the global and regional level. The report provides an analysis of the global video conferencing market for the period from 2016 to 2026, wherein the period from 2018 to 2026 comprises the forecast period and 2017 is the base year. Data for 2016 is provided as historical information. The report covers all the major trends influencing the expansion of the video conferencing market during the forecast period. It also highlights various drivers, restraints, and opportunities that are expected to affect the expansion of the market during this period. 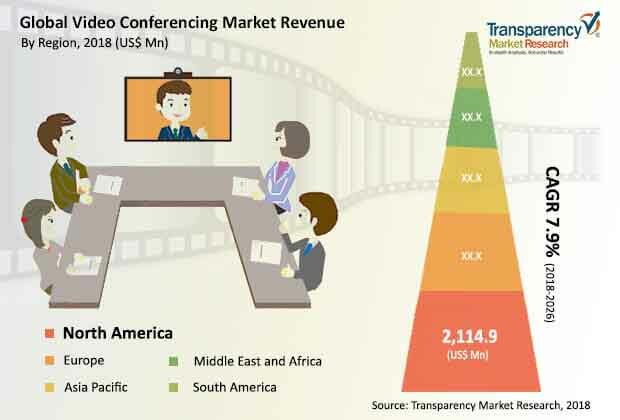 The study provides a complete perspective on the expansion of the video conferencing market in terms of revenue in US$ Mn, across different geographical regions, namely, North America, Europe, Asia Pacific, Middle East & Africa, and South America. The report is expected to help manufacturers, suppliers, and distributors understand the current and future trends in the market and formulate their strategies accordingly. The market overview section of the report showcases the market dynamics and trends such as the drivers, restraints, and opportunities that influence the current nature and future status of this market. The report also provides the value chain analysis for the video conferencing market. These market estimates have been analyzed by taking into account the impact of different political, social, economic, technological, and legal factors along with the current market dynamics affecting the expansion of the market. Video conferencing market is segmented based on component and end-use industry. Based on component, the global video conferencing market is categorized into hardware, software, and services. Among these components, the hardware component segment is further sub-segmented into camera, codec, microphone/speakers, and others. The software segment is further classified into on-premise and cloud-based. Furthermore, the services segment is further split into managed/outsourced and others. Based on end-use industry, the global videoconferencing market segment is categorized into corporate enterprise, healthcare, government and defense, education, and others. Revenue data is estimated for all the segments mentioned above. The report also includes competitive profiling of the key players associated with the video conferencing market around the globe. The important business strategies adopted by leading players, their market positioning, financials, SWOT analysis, and recent developments have also been identified in the research report. The competitive landscape section of the report also provides an overview about the major contributing regions/countries by these key players in order to strengthen their market position in the future. The research methodology is a perfect combination of primary research, secondary research and expert panel reviews. Secondary sources such as annual reports, company websites, SEC filings and investor presentations, internal and external proprietary databases, statistical databases, relevant patent and regulatory databases, market reports, government publications, World Bank database, and industry white papers are usually referred for developing preliminary market understanding. Further, for this report we have specifically focused on data from various national telecom authorities, and industry bodies. Primary research involves telephonic interviews, e-mail interactions, and face-to-face interviews for detailed and unbiased reviews on the master recharge API market, across geographies. Primary interviews are usually conducted on an ongoing basis with industry experts and participants in order to get latest market insights and validate the existing data and analysis. Primary interviews offer new and fresh information on important factors such as market trends, market size, competitive landscape, growth trends, etc. These factors help to validate and strengthen secondary research findings. Moreover, the data collected and analyzed from secondary and primary research, is again discussed and examined by our expert panel. Increasing number of multinational companies (MNCs), and globalization of supply chain have led to the rise in demand for effective long-distance communication involving multiple locations. This has prompted companies to develop advanced and integrated video conferencing solutions in order to sustain in the market. Adobe Systems Incorporated, Arkadin Cloud Communications, Cisco Systems, Inc., Huawei Technologies Co., Ltd., JOYCE CR, S.R.O., Logitech International S.A., Microsoft Corporation, Orange Business Services, Polycom, Inc., Vidyo, Inc., West Unified Communications Services and ZTE Corporation, are few of the key players who have been profiled in this study. Details such as financials, business strategies, SWOT analysis, recent developments, and other strategic information pertaining to these players have been duly provided as part of company profiles.